Discussion in 'Tools and Materials' started by ban-all-sheds, 12 Oct 2018. Just cut the top of them with a grinder or junior hack saw. Nearest I can think of are either a "Coach Bolt" or "Coach screw"
Your image appears to have [the course thread] coach bolt appearance. The Engineering threads at the other end? ? ? ? 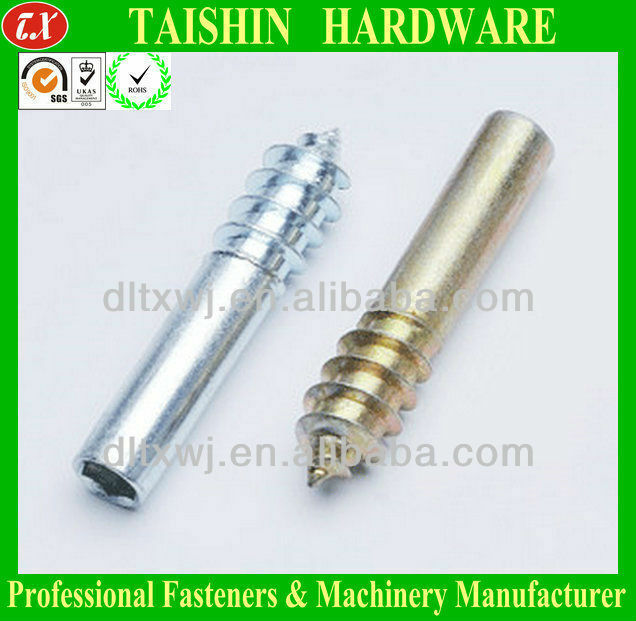 They are called dual thread dowel screws. A coach screw with the head off could suit you? That's what I don't want. Grind a flat on the shank and use an adjustable spanner to screw them in. Looks like a hanger bolt to me? [QUOTE="ban-all-sheds, post: 4236809, member: 3777"
Something like a Plain shank wood screw? A pair of vice grips will screw in headless screws or remove them. Definitely just go with cutting off the head of something existing and grind a slot in the top for a slotted screwdriver, if you can't screw them in first and then cut off the head. Just to be sure, in case you haven't built cheap flat pack furniture, you have seen these before, right? Pick Handle - Wood or Fibreglass?